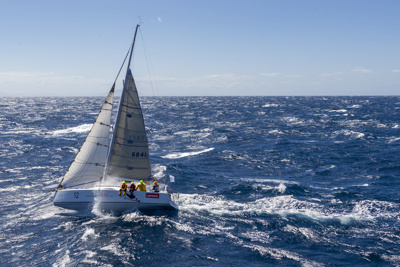 Papillon has competed in six Rolex Sydney Hobart Yacht Races. In 2011, Papillon was third on IRC in Division 3 of the RSHYR. In 2013, she was second overall on IRC in the Sydney Gold Coast Yacht Race and placed third in the Blue Water Pointscore. In the 2015 RSHYR, Phil Molony sailed Papillon to 28th overall, the previous year, the yachtsman marked his milestone 25th Sydney Hobart with 17th overall. After a break last year, Papillon is getting the crew back together for one more Sydney Hobart. They are coming from all over; Alec from Newport RI USA, Jim from Perth, Mick Sheehy from Melbourne and Olivia from Hobart. Our two watch captains, Ralph and Mick Tilden are coming from Lake Macquarie and Wollongong respectively. The other crew members are all from Sydney; Julie, Michael, Geoff and Phil. Everyone but Geoff has done at least one Sydney Hobart aboard. It will be Julie’s and Mick Tilden’s sixth time on board, while Alec and Mick Sheehy will be doing their fifth.